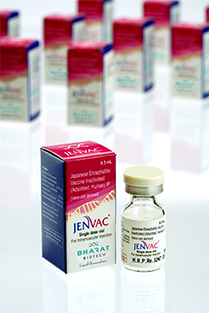 JENVAC is a single dose inactivated Japanese Encephalitis (JE) Vaccine. This Vero cell derived vaccine is prepared from an Indian strain (Kolar- 821564XY) of the JE virus. JENVAC has been developed in collaboration with the National Institute of Virology, India. It is a safe and highly-effective vaccine that protects against all known strains of Japanese Encephalitis. Data of 2-dose study shows that a single dose of JENVAC is sufficient to elicit the immune response as the subjects who received a single dose were 98.67% sero-protected and the 4-fold sero-conversion was at 93.14% for the ≥1 year to ≤50 years age group.